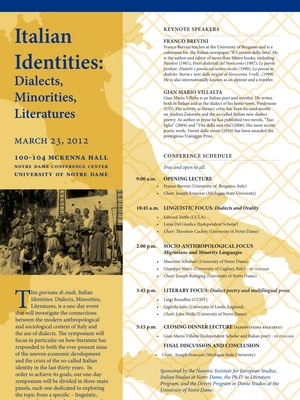 Italian Studies at Notre Dame announces the “giornata di studi” Italian Identities: Dialects, Minorities, Literatures. This one-day conference will investigate the connections between the modern anthropological and sociological context of Italy and the use of dialects. The conference will focus in particular on how literature has responded to both the ever-present issue of the uneven economic development and the crisis of the so-called Italian identity in the last thirty years. In order to achieve its goals, our one-day symposium will be divided in three main panels, each one dedicated to exploring the topic from a specific – linguistic, socio-anthropological and more purely literary – perspective. For the complete conference schedule, visit italianstudies.nd.edu. For more information, contact Damiano Benvegnù (dbenvegn@nd.edu). Sponsored by the Nanovic Institute for European Studies, Italian Studies at Notre Dame, the Ph.D. in Literature Program, and the Devers Program in Dante Studies at the University of Notre Dame. Edward Tuttle (UCLA): Dialect Diversity and Diverse Dialects: a Brief Typology of Language Variety in Italy. Gigliola Sulis (University of Leeds, UK): Dialects and multilingual fiction. Literary trends and critical perceptions in contemporary Italy (1980s-2010s).